Regardless of their reasons for moving abroad, Swiss expats are much more satisfied than the average expat — and might stay for good. 44% anticipate staying in their new country forever. 90% are generally satisfied with their relationship. Finance is the top field for working expats. For many Swiss nationals, expat life seems to have been a positive decision, as quite a few stay abroad for some time. Whether it’s because of a better quality of life or their ease in feeling at home, a majority of Swiss expats (73%) have been living in their current country of residence for at least two years, 29% even for more than ten years. Over two in five Swiss expats (44%) also anticipate staying in their new country forever. Among Swiss expats, previous experience with living abroad varies quite significantly: 38% say that they have stayed in only one other foreign country (if any at all), while 28% report having stayed in four or more countries in the past. As a whole, they are more likely to have lived abroad in a number of countries, though, when compared to the global averages of 51% and 16%, respectively. Regardless of previous stays abroad, Swiss expats seem to have a talent for feeling at home wherever they go: more than seven in ten (71%) feel at home in their new country, compared to a global average of 64%. With 83%, Swiss expats are also more likely to say they are generally satisfied with their life than the average survey respondent (75%). What causes the Swiss to adapt to a new culture and way of living with such relative ease? Language skills may have something to do with it. Among the Swiss respondents, 46% say they considered the local language a potential benefit before moving to their new destination, slightly more than the global average of 41%. Only 6% do not speak the local language of their new home, while the majority (71%) can speak it at least fairly well, including two in five with excellent language skills. Despite a Swiss expat population fluent or nearly fluent in more than their native tongue, very few (2%) moved abroad strictly to improve their language skills, though. Many Swiss expats hold a postgraduate degree (master’s degree or similar: 39%) or even a PhD (8%). However, Swiss expats tend to make less than they would back home. 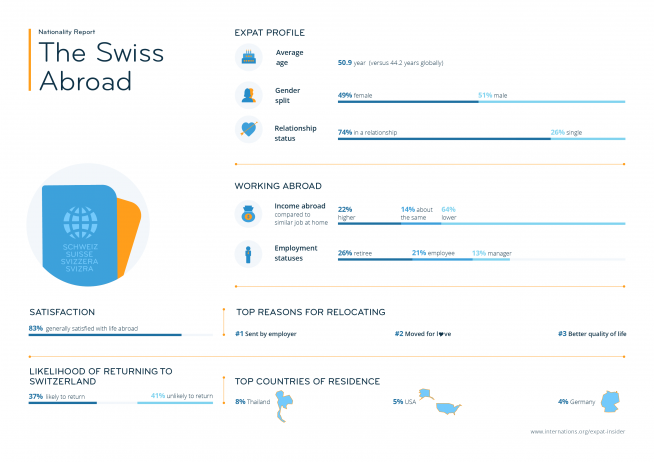 Among working expats from Switzerland, 64% say that their income is less than what it would be back home, and for nearly two in five (38%), it is even a lot lower. This is hardly surprising, considering the famously high salaries in Switzerland. Despite a possibly lower income, the Swiss are not afraid of moving for work. The top “occupation” among Swiss expats is retiree (26%), which explains their high average age of 50.9 years, compared to the survey average of 44.2 years. Nevertheless, work-related reasons account for 29% of Swiss respondents moving abroad, with 21% currently being employees. The fields of work that attract most expats from Switzerland are finance (11%) and the public sector: one in ten Swiss expats works in the latter, compared to a global average of only 3%. When it comes to working conditions, many Swiss respondents report a slightly more relaxed environment: only 69% work full time in their new country, which is quite low compared to the worldwide percentage of 84%. This relatively low percentage of full-time workers could also contribute to lower incomes. 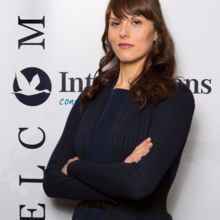 One Swiss national working in Australia, for example, praises the work-life balance they have found in their new country of residence. However, the Swiss abroad who are working full time seem to really be putting in the hours: on average, they spend 46.4 hours a week at their job, compared to a survey average of 44.0 hours. The satisfaction rate among Swiss expats when it comes to relationships is quite noteworthy. Among the 74% of Swiss expats who are in a relationship, nine in ten are currently living in the same country as their partner, and the same percentage is also generally satisfied with their relationship. What’s a lot more surprising, however, is the percentage of Swiss expats in international relationships: only 27% of Swiss expats in a relationship have a significant other who is also from Switzerland. 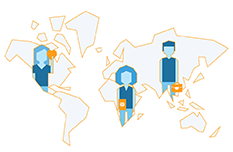 This is a noticeably lower share than among expats worldwide: 43% of all respondents in a relationship are together with someone of the same nationality. Despite the large percentage of expats in an intercultural relationship, Swiss abroad are not significantly more likely to find making local friends in their host country easy. One-third share that this is in fact not easy, which is mostly in line with the global average of 36%. Social circles in general tend to be fairly mixed: 20% describe their friends and acquaintances as mostly local residents, 31% say most of their friends are other expats, and just about half (49%) report having a friend group that is a mixture of the two. Federal Statistical Office of Switzerland. Income Distribution.